Cheap Multimeter Leads Come With Extra Ohms, Free! [Nop head] discovered that cheap multimeter leads costing only a few bucks can come with more than one may have bargained for. The first set had a large amount of useful-looking attachments, but the wires used for the leads were steel with a resistance of about one ohm each. With two leads in use, that means any resistance measurement gets two ohms added for free. More seriously, when measuring current, the wires can heat up rapidly. Voltage measurements would be affected the least, but the attachments and lead design expose a large amount of bare metal, which invites accidental shorts and can be a safety hazard with higher voltages. Are all cheap multimeter leads similarly useless? Not necessarily. [nop head] also purchased the set pictured here. It has no attachments, but was a much better design and had a resistance of only 64 milliohms. Not great, but certainly serviceable and clearly a much better value than the other set. It’s usually not possible to identify garbage before it’s purchased, but [nop head] reminds us that if you do end up with trash in hand, poor quality counterfeits can be good for a refund. That goes for electronic components, too. Since 1999, one of the more popular manufacturers of test equipment has been Agilent, the spun-off former instrument division of Hewlett-Packard. From simple multimeters to fully-equipped oscilloscopes, they have been covering every corner of this particular market. And, with the help of [Kerry Wong] and his teardown of an Agilent LCR meter, we can also see that they’ve been making consistent upgrades to their equipment as well. The particular meter that [Kerry] took apart was an Agilent U1731B, a capable LCR (inductance, capacitance, resistance) meter. He had needed one for himself and noted that while they’re expensive when new, they can be found at a bargain used, but that means dealing with older versions of hardware. For example, his meter uses an 8-bit ADC while the more recent U1733 series uses a 24-bit ADC. The other quality of this meter that [Kerry] made special note of was how densely populated the circuit board is, presumably to save on the design of a VLSI circuit. While we don’t claim to stump for Agilent in any way, it’s good to know that newer releases of their equipment actually have improved hardware and aren’t just rebadged or firmware-upgraded versions of old hardware with a bigger price tag attached. Also, there wasn’t really any goal that [Kerry] had in mind besides sheer curiosity and a willingness to dive deep into electronics details, as those familiar with his other projects know already. [Diode Gone Wild] and his cat decided to see how a $3 meter worked inside. The meter was marked as a DT-830B and he already had an older one of the same model, and he wondered how they could afford to sell it — including shipping — for $3. You can see a video of his testing, teardown, and reverse engineering below. What was odd is that despite having the same model number, the size of the meter was a bit different. When he opened the case to install a battery, he noticed the board didn’t look like it had fuses or components appropriate for the rated voltages. He decided the missing parts might be under the board and tested the meter. If you want to log voltages or resistance these days, no problem. You can buy a multimeter with Bluetooth for a hundred bucks, and if you’re really fancy you can spring for the Fluke with a graphical display that will log values automatically. Things weren’t always this cheap and easy, but there was always a way to do it. Back in the 80s, HP had GPIB, or HP-IB, or IEEE-488 connectors on the back of their benchtop equipment. This was an 8-bit interface not unlike a parallel port that allowed for remote control of test equipment. In a great demonstration of what this was actually like, [AkBKukU] posted a video of connecting an old benchtop multimeter to a vintage computer over GPIB. The computer used for this feat of retrotechtacularness is an HP Series 80, a footnote in the history of desktop computers, but it does have a custom CPU and BASIC in ROM. As you would expect from vintage HP gear, there are a few slots on the back of the computer for connecting interface boxes, including a modem, a speech synthesizer, and of course, an HP-IB interface that can speak IEEE-488. With the multimeter connected to the computer over the daisy-chainable parallel interface, it was a simple matter of writing a little bit of BASIC to read a potentiometer and a thermistor. With a little bit more code, this computer can even produce a graph of the resistance over time. This is data logging like it’s 1982, and it’s a fantastic example of exactly how far we’ve come. If you haven’t heard of it, the Mooshimeter is a two channel multimeter that uses your smartphone as a display over Bluetooth 4.0. The ability to simultaneously monitor voltage and current is rather unique, and the fact that you aren’t physically tethered to the thing makes it ideal for use in hard to reach or even dangerous locations. The promotional material for the Mooshimeter shows users doing things like leaving the device inside the engine compartment of a car while they drive around and take readings about the vehicle’s electrical system. All that sounds well and good, but at the end of the day, the Mooshimeter is probably not going to be your primary multimeter. It’s going to stay on a shelf until a task befitting its unique abilities comes along. Unfortunately, as [nop head] found, that can be a problem. Like many modern devices, the Mooshimeter doesn’t actually turn off. It just sits there draining its battery until you’re ready to use it. Which of course means that when you’re finally ready to pull the thing out and put it to use, you get a low battery warning and need to put new AAs in it. First World problems. The fix for this thoroughly modern problem is delightfully old school: a mercury tilt switch. Using a small spacer made of Kapton tape, [nop head] was able to isolate the battery contacts from the PCB itself. He then soldered the mercury switch in place between them, making sure to position the bulb vertically. When the Mooshimeter is right side up, the mercury flows down and bridges the contacts; but when the device is inverted the contact is broken and the batteries stop draining. He still has to remember to put the Mooshimeter face down when he’s done with it, but it’s better than dealing with constant dead batteries. There was a lot of initial interest in the Mooshimeter when it was announced in 2014, but we’ve seen precious little of it since. It certainly seems neat, but perhaps it’s a bit too niche for its own good? If Mooshimeter fulfills a critical role in your tool set, let us know in the comments below. We have a contest going on right now challenging you to do the most with a coin cell. 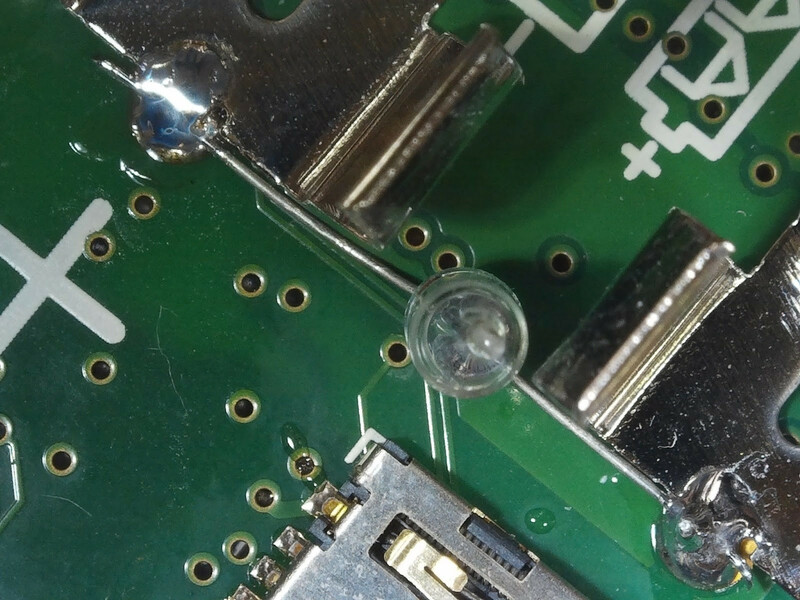 There are already quite a few interesting entries, and a few Hackaday writers are getting into the action by asking the question, ‘how do you open up a coin cell?’. The first thoughts were to open a lithium coin cell up while submerged in oil, but eBay came to the rescue with the cases for CR2025 cells. Of course that’s a thing. Also falling into the, ‘of course that’s a thing’ category, there’s a project on Hackaday.io to execute arbitrary code on a calculator. A small group of calculator hackers have discovered an exploit on a line of Casio calculators running the obscure nX-U8/100 architecture. Right now, there’s not much to the project — just an LCD filled with bits of memory. However, this is a project we’re keenly watching, and we can’t wait to see what comes of it. Hold onto your butts, because the ultimate multimeter is here. [Dave Jones] of the EEVBlog has released the 121GW Multimeter on Kickstarter. What’s cool about this meter? SD card logging, the ability to send data over Bluetooth, a 15V diode test voltage, a burden voltage display, and a whole bunch of hackable features. If you have a Fluke on your Christmas list, you would do well to check out the 121GW. Also on Kickstarter, a new LattePanda board has been released. What’s a LattePanda? It’s a small single board computer built around a low-voltage Intel processor. This board features an Intel m3-7Y30 processor, comparable to the processor you’d get in a proper laptop that doesn’t have an i3, 8 gigs of DDR3, 64 gigs of eMMC, 802.11ac, BlueTooth 4.2, USB 3.0 with a Type C connector, HDMI, and a whole bunch of GPIOs. Yes, it runs Windows (but why would you?). If you need a somewhat beefy x86 system in a small form factor, there ‘ya go. We’ve seen 3D printed remote-controlled airplanes, but never one this big. The guys at Flite Test printed a 1.6 meter Spitfire. It’s got flaps, it’s got retracts, and it’s friggin’ huge. The files for the print came from 3DLabPrint, and it flies beautifully, despite being a Spitfire. Want to see the video? Here ya go. I have a fascination with the various online vendors of electronics and other manufactured goods from China. Here are listed the latest wonders from Shenzhen or wherever, which you can have for a surprisingly reasonable price, with the mild inconvenience of a three week wait for the postage. A particular pastime of mine is to look for the bottom end of the market. Once I’ve picked up the items I came to order I’ll trawl around with the search with low price first and see what can be had for a few dollars. Yes, I take a delight in finding absolute trash, because just sometimes that way you can find a diamond in the rough. So when I was shopping for a multimeter recently I took a quick look to see what the cheapest model from that particular supplier was. 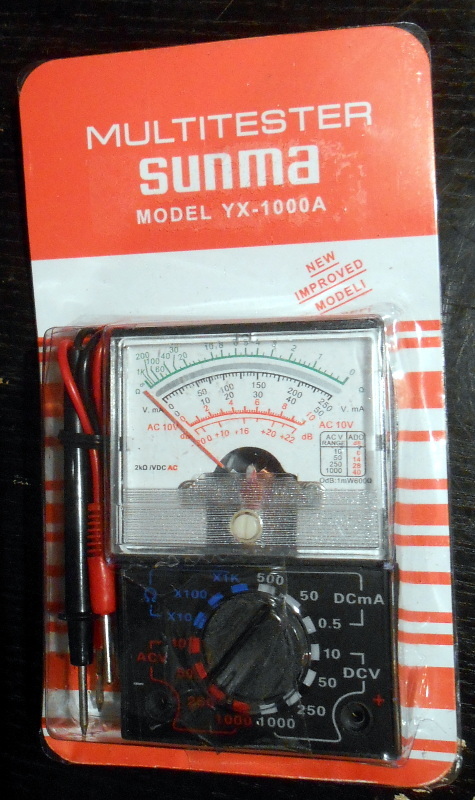 For somewhere around £2.50 or just over $3, I could have a little pocket analogue multimeter, the kind of “My first multimeter” that one might have found in the 1980s. They weren’t too bad, I thought, and ordered one for less than a pint of beer in a British pub.